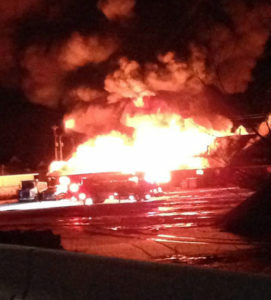 This fire destroyed Hamilton County snowplows . A fire Sunday morning at the Hamilton County Maintenance Shed in Webster City destroyed thousands of dollars worth of equipment and leaves the county short of available snowplows. Webster City firefighters were called out at 5:15 a-m Sunday and were joined by firefighters from Duncombe, Stanhope and Woolstock as they worked at the scene for much of the day Sunday. Hamilton County Engineer Nikki Stinn inspected the damage Sunday morning. She says the heating and air conditioning and half the building was lost along with two plow trucks, seven pickups, and a lot of other equipment. Stinn says the two plow trucks are worth around $200,000 each and the seven pickups are worth around $30,000 each. They are still figuring out the cost of the lost building and other equipment. Stinn says the fire leaves them short of equipment if there is any winter weather — but they will adjust. She says they could use road graders that normally work on gravel on the paved streets if they need to plow snow. “We will get it covered if we have events — it just might be a hair slower than normal,” Stinn says. The State Fire Marshal has been called to help the Webster City fire department find the cause of the fire. No one was injured in the fire.